Four new drawings added to the series. James Mundie's work is included in Side Show, an exhibtion at Yale University curated by Lizsa Kereszi. Also included in the exhibition are works by Diane Arbus, Max Beckman, Weegee, Otto Dix, Johnny Meah, John Waters, Edward Kelty, Marie Roberts, Snap Wyatt, Riva Lehrer, and more. James Mundie's portrait J. R. Bass, The Ossified Man has been purchased for the collection of The Fellowship of the Pennsylvania Academy of the Fine Arts. This drawing will be on display in the 113th Fellowship Exhbition at PAFA from 25 July through 9 September 2012. 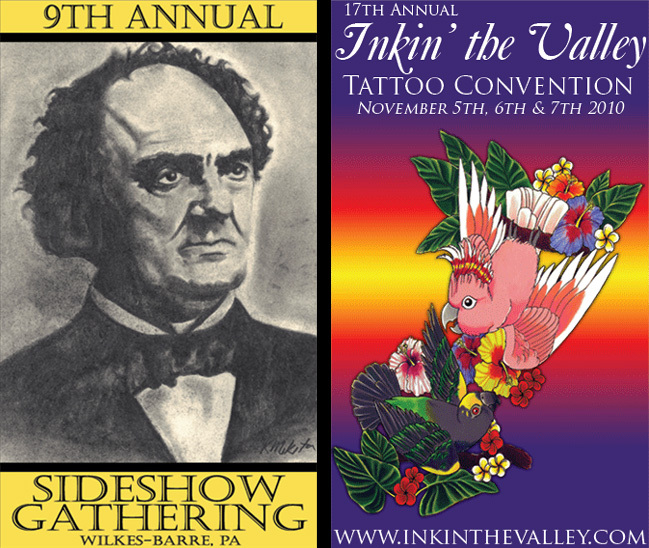 Come one, come all to the 9th Annual Sideshow Gathering at Inkin' The Valley in Wilkes-Barre PA, November 5th-7th! The Annual Sideshow Gathering is the premier networking event for performers, fans, collectors, historians, and the curious. This year marks the 200th anniversary of the birth of P. T. Barnum, the man who single-handedly created modern advertising and brought some of history's most celebrated human oddities to national prominence. Barnum knew how to indulge the public's curiosity and send them away satisfied and filled with wonder. It is in the spirit of Barnum that the Sideshow Gathering brings together many of today's best sideshow performers for a weekend of gasps, shrieks, and laughs. Click here for more informtion and performer biographies. A brand new body of work — and a new website — is now ready for viewing: James G. Mundie's Cabinet of Curiosities features original photographs, drawings, and prints from anatomy and medical museums. From 11 September through 9 October 2009, eight drawings from James G. Mundie's Prodigies were featured in Beautiful Human in the Cantor Fitzgerald Gallery at Haverford College. Curated exclusively for Haverford by Philadelphia artist and educator Shelley Spector, founder and director of Spector Gallery/Projects, Beautiful Human presents unique explorations of human life by six Philadelphia-based artists: Donald E. Camp, Matthew Fisher, Laura Graham, Rob Matthews, Joshua Mosley, and James Mundie. The exhibition ran in the Cantor Fitzgerald Gallery from Friday, 11 September through 9 October 2009. An opening reception was be held Friday, September 11th, from 5:30-7:30 PM in the Gallery. An artists' panel discussion moderated by Robert Cozzolino, Curator of Modern Art at the Pennsylvania Academy of the Fine Arts, was held Tuesday, September 22nd, at 4:30 PM in the Sharpless Auditorium of the Koshland Integrated Natural Sciences Center (KINSC). From 9 May through 6 June 2009, six pieces from James G. Mundie's Cabinet of Curiosities were featured in The Morbid Anatomy Cabinet: Gallery as Wunderkammer at Barrister's Gallery in New Orleans. The exhibition was curated by Joanna Ebenstein of the Morbid Anatomy blog. Barrister's Gallery is located at 2331 St. Claude Avenue and Spain, New Orleans LA 70117. From 9 April through 9 May 2009, eighteen new photographs from James G. Mundie's Cabinet of Curiosities were featured in Shock & Horror: Human Oddities and Medical Marvels at Todd/Browning Gallery in downtown Los Angeles CA. Jim's work hung alongside vintage photographs by the likes of Charles Eisenmann. A preview video of the show may be seen here. Todd/Browning Gallery is located at 211 West 5th Street (between Spring & Broadway), Los Angeles CA 90013. 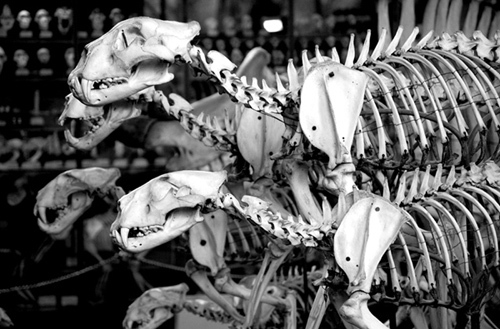 In February, ten photographs from James G. Mundie's Cabinet of Curiosities were featured in New Scientist. Sixteen pieces from James G. Mundie's Cabinet of Curiosities were featured in Alumni Travel Grant Exhibition at the Center for Emerging Visual Artists, 26 February through 19 March 2009. The Center for Emerging Visual Artists is located at 237 South 18th Street, Suite #3-A, Philadelphia PA 19103. James Mundie has contributed several photographs from his new series Cabinet of Curiosities (look for more information about that soon!) to a new documentary by Firecracker Films. 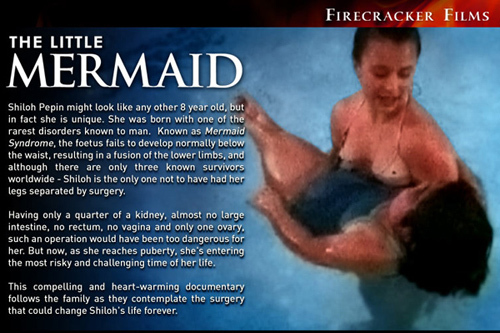 The film, The Little Mermaid, follows young Shiloh Pepin — a girl born with Mermaid syndrome — as she contemplates surgery. The film airs in the United Kingdom on Five starting 9 October 2008, and in the United States on Discovery Health later in the month. UPDATE: I am sad to report that Shiloh Pepin passed away on 23 October 2009. You can read more about her on a website maintained by her family. You may now see a sampling of the hundreds of new photographs from European anatomy museums that James Mundie took in Holland and France in February 2008. This is the start of a new body of work called Cabinet of Wonders. James Mundie returned from a European trip visiting medical museums to discover that he has been awarded a 2008 Individual Creative Artists Fellowship from the Pennsylvania Council on the Arts. Individual Creative Artists Fellowships are awarded annually in selected categories. The 2008 awards were available in dance - choreography; folk and traditional arts – performing traditions; literature – poetry; media arts – documentary and narrative; music – classical composition; theatre – scriptworks (for playwrights and screenwriters); and visual arts – painting or drawing/artist’s books/printmaking or new technologies/other genres. The goal of the PCA’s individual creative artists division is to encourage and enable outstanding Pennsylvania artists of all backgrounds to perform their work and display it to the public. The council annually awards fellowships of $5,000 and $10,000. Recipients are recommended after a rigorous evaluation process where qualified arts professionals review applicants’ work samples and support materials. The review process is anonymous, with the exception of the folk and traditional arts applications. This year, the council will collaborate with the Institute for Cultural Partnerships, Mid-Atlantic Arts Foundation and Pittsburgh Filmmakers to provide administrative services for the PCA’s fellowship program. The Pennsylvania Council on the Arts is a state agency that works to develop and promote the continued excellence, diversity and vitality of the arts in Pennsylvania, as well as to broaden the availability and appreciation of arts throughout the state. For more information, visit www.pacouncilonthearts.org, or call 717-787-6883. James Mundie will be showing recent drawings, prints, and photographs alongside Col. J.D. Wilkes and Brett Whitacre in Freeks and Geaks at The Plowhaus, 20 July – 5 August 2007. 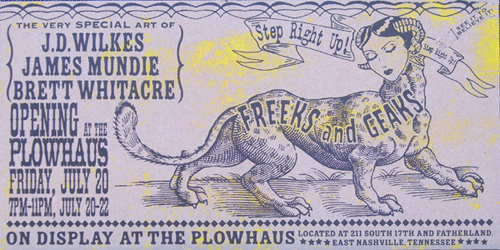 The Plowhaus is located at 211 South 17th Street, East Nashville TN 37206. James Mundie has been busily engaged in photographic pursuits, the results of which may be seen on his Flickr profile. Subjects for his camera include the quirkiness of South Philadelphia, Eastern State Penitentiary, Coney Island, and the Mütter Museum. James Mundie has received a 2007 Alumni Travel Grant from the Center for Emerging Visual Artists. James intends to spend days at a time in various medical museums (for instance, the Museum Vrolik in Amsterdam), drawing and sketching on site from unusual specimens in order to find new source material for a body of work tentatively titled Cabinet of Curiosities. James Mundie was recently interviewed about his collection of historic sideshow items on Ephemera: exploring the world of old paper. 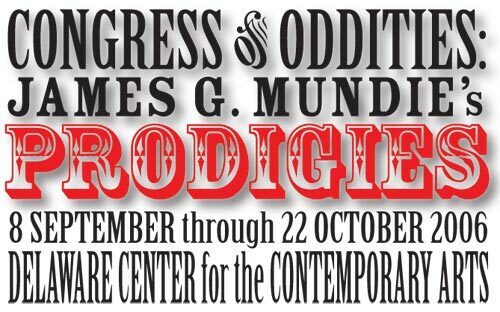 Prodigies was featured in two major exhibitions this year: a reprisal of Alive Inside: The Lure and Lore of the Sideshow at Purdue University (28 August – 8 October 2006), and a solo exhibition entitled Congress of Oddities: James G. Mundie's Prodigies at the Delaware Center for Contemporary Arts (8 September – 22 October 2006). 20 November: Brand new drawing, Midget Fat Lady with a Parrot, added to the Gallery. Drawn Inside is an exhibition highlighting not just the exceptional draughtsmanship of three artists, but how they use their imagery to pull	the viewer into their conceptual worlds. This group of three artists, through the mastery of their techniques and a healthy dose of humor, invite the viewer into their worlds of politics, sexuality, sociology and anthropology. Drawn Inside was on view in the The Felicity R. "Bebe" Benoliel Gallery of The Center For Emerging Visual Artists (formerly Creative Artists Network) 27 October through 23 November 2005. The Center for Emerging Visual Artists is located at 237 South 18th Street, Suite 3-A, Philadelphia PA 19103. See what transpired at the 4th Annual Sideshow Gathering and be both shocked and amazed! 28 April: Three new drawings added to Prodigies — Three-eyed Man and Child, The Whiskey Drinker, and The Wild Man Tending His Flock! James Mundie has posted his photographs of Hall & Christ's World of Wonders at the 2005 Pennsylvania State Fair. Freaks! Strange girls! Funnel cake! James Mundie showed six drawings from Prodigies in Step Right Up! Sideshow Wonders and Human Curiosities, an exhibition at Orange Hill Art in Atlanta, Georgia, 22 July through 1 September 2005. Also featured were Kevin House, Col. J.D. Wilkes, Jeffery Pratt Gordon's collection of Johnny Eck memorabilia, and Alabama folk artist Butch Anthony displaying items from his Museum of Wonder. The show also featured vintage sideshow banners from the 1930s through '50s. An opening reception was held on 28 July 2005 from 7:00 to 9:00 P.M. The reception was followed by music and sideshow festivities at the After Party at the Star Bar in Little Five Points, during which Kevin House, Sideshow Bennie, and Those Legendary Shack*Shakers performed. Orange Hill Art, Inc. is located at 331 Elizabeth Street NE, Suite C, Atlanta GA 30307. MundieArt.com, featuring drawings, paintings, and prints by Kate Kern Mundie and James G. Mundie is now on-line. James Mundie was among several artists invited by curator and author Mark Sloan to participate in Alive Inside: The Lure and Lore of the Sideshow. The exhibition — part of the Piccolo Spoleto Festival — was held in Charleston, South Carolina, from 13 May to 15 June 2005. The show was be housed in several venues, including the William Halsey Gallery at the School of the Arts, College of Charleston, and Redux Contemporary Art Center. A progressive opening began at 5:00 P.M. on 13 May 2005, culminating at the Music Farm with Son of SinSoRama — the event featured musical performances (David Boatright's Minimum Wage, songsmith and thereminist Kevin House, and Those Legendary Shack Shakers), and various flirtations with mirth and death — including a special performance by Sideshow Bennie. The artists in this exhibition included: David Boatwright, Sarina Brewer, the late Johnny Eck, Kevin House, Andrea Mai Lekberg, Leigh Magar, James G. Mundie, Joe Petro, Max Rada Dada, Madame Talbot, Col. J.D. Wilkes, Kurt Webb and Kreg Yingst. See photographs from the exhibition and opening here. James Mundie exhibited four works from Prodigies in The Academy at Penn, a juried exhibition of Pennsylvania Academy of the Fine Arts alumni who received their bachelors degrees from the University of Pennsylvania through the coordinated program that has existed between the two institutions since 1922. The exhibition was held in the Kroiz Gallery in Penn's Fisher Fine Arts Library from 28 April through 8 June 2005. An opening reception was held on Friday, 13 May, from 5:00—8:00 P.M.
During the month of February, the popular and irreverent website missionCREEP.com manifested itself boldly in the physical realm with the first ever group exhibition of the on-line collective's artwork. The exhibition, titled missionCREEP.com: Live! 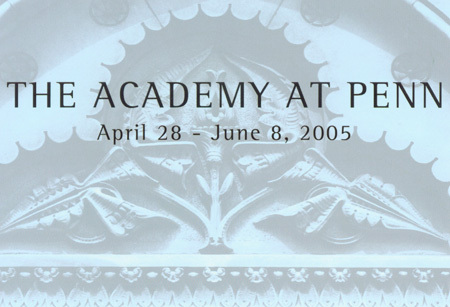 took place in Philadelphia's Nexus: Foundation for Today's Arts, 4 — 27 February 2005. The exhibition featured Susan Hagen, James G. Mundie, Sarah McEneaney, Tina Newberry, Bill Amundson, Judith Schaechter, Ted Adams, Carol Nowak, Jim Knipfel, Mitch Gillette, Mike Walsh, and the underground zine Expresso Tilt. A stunning catalog of the exhibition, written and prepared by Mike Walsh, is available for purchase (40 pages, full color, $9.93 plus shipping). Order today! James Mundie's work is the subject of an article in the Autumn 2004 Artist Newsletter published by Strathmore, the makers of fine artist papers. "Prodigies: Portrait Drawings of Unusual Characters" is available on-line now. 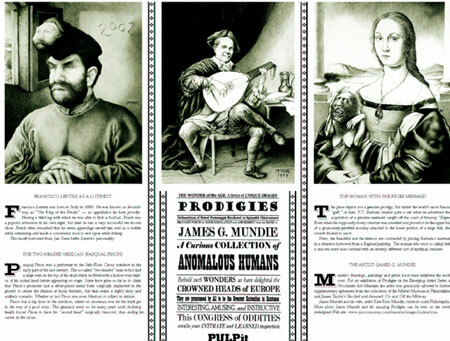 Associated Press writer Michael Rubinkam published an article which discusses how Mundie's Prodigies website has become a conduit for descendants of sideshow performers to connect and share genealogical information. The article, "Artwork Draws Circus Performers' Descendants" went out the afternoon of Friday, 20 August 2004, and was picked up by numerous publications. Look for an extended national version of the article to be released soon. Mundie's Infanta Esau appeared in the group exhibition Embracing the Arts: Creative Artists Network at The Delaware Center for the Contemporary Arts (Wilmington DE), 4 June through 3 October 2004. The exhibition included works by selected artists, alumni and advisors of the Creative Artists Network in Philadelphia, now known as the Center for Emerging Visual Artists. James Mundie's Prodigies is the subject of a feature article by Samuel Hughes in the July|August 2004 issue of The Pennsylvania Gazette, a publication of the University of Pennsylvania. It is with great sadness that I report the terrible news that Gretchen Worden, director of The Mütter Museum of the College of Physicians of Philadelphia, passed away on Monday, 2 August 2004. For those of you who didn't know her, Gretchen Worden was a kind-hearted and generous spirit with a wicked sense of humor. She was always most gracious to me (and many others), generously giving both her time and advice. I was honored when Gretchen invited me to poke around in the back storage rooms of the Mütter Museum, and ecstatic when she bestowed upon me the very great honor of allowing me to borrow several valuable items from the Mütter's collection for one of my exhibitions. She was keenly aware and appreciative of artists like myself who found a strange beauty in the Mütter's collection of unusual medical specimens, and the access to these resources that she provided for us non-medical folk was unprecedented. Gretchen Worden, who devoted her entire professional career to revitalizing the Mütter Museum of the College of Physicians of Philadelphia, died August 2nd after a brief illness. Ms. Worden relied on an encyclopedic knowledge of medical history, a tart sense of humor and a compelling television presence to forge an international reputation as a museum educator and spokeswoman for the Mütter. Her recent book about the museum became a best seller. She was a frequent guest on The Late Show With David Letterman and appeared in numerous science documentaries produced by the BBC. Ms. Worden, who was 57, continued to work until a few days before her death. Ms. Worden, the daughter of a Standard Oil geologist, was born in Shanghai, China in 1947. She graduated from Temple University with a degree in Anthropology in 1970. She joined the staff of the College's Mütter Museum as a curatorial assistant in 1975. Ms. Worden became the museum's curator in 1982 and its director in 1988. As the leader of the museum, she presided over a facility with unique historical and pathological collections that was little known to the public. Knowing that its long-term future depended on the museum's acquiring a higher public profile, Ms. Worden worked tirelessly to promote it. Her efforts included numerous appearances on television and radio, offering lectures about the museum from Philadelphia to Paris and launching a popular series of museum calendars. When Ms. Worden became curator in 1982, the museum attracted several hundred visitors each year. At the time of her death, museum visitation had grown to more than 60,000 tourists annually. Ms. Worden's ultimate goal was to have the Mütter Museum accredited by the American Association of Museums. Commenting on Ms. Worden's contributions to the College of Physicians, College President Arthur Asbury, M.D. noted that "The College of Physicians is deeply saddened by the loss of Gretchen Worden. She embodied the Mütter Museum both locally and nationally for three decades. She is irreplaceable". Recalling his own experience working with Ms. Worden, the College's Chief Executive Officer Mark S. Hochberg, M.D. said "Gretchen was an incandescent personality. She represented a unique combination of curatorial brilliance, superb communication skills and irresistible charm. The College of Physicians family has lost a treasured colleague and friend". Gretchen Worden was known for her wide ranging intellectual interests. She was a past president of the Medical Museums Association, Museum Council of Philadelphia and the Delaware Valley and the Walt Whitman Association. She was a long serving member of the Board of the Friends of Independence National Historical Park. Several hundred people attended Gretchen's memorial service to share their recollections of her and celebrate her life. The obituary notice that appeared in the 4 August 2004 edition of the Philadelphia Inquirer may be read here. Six drawings from Prodigies appeared in a group show in New York City at MF Gallery, 19 June through 30 July 2004. Freak Show Art Exhibit featured freaky works by Mundie, John John Jesse, Martina Secondo, Stephen Blickenstaff, Frank Russo, Amy Hill, Kevin House, Drew Maillard, and others. James Mundie was one of several printmakers invited to participate in Several Steps Removed, an exhibition presented jointly by the Samuel S. Fleisher Art Memorial and the Philadelphia Print Collaborative as part of the The Big Nothing, a city-wide initiative set in motion by the Institute of Contemporary Art. The exhibition was held at Fleisher from 5 July through 6 August 2004. James Mundie's The Nova Scotia Giantess and the Lilliputian King was chosen for an exhibition of works by alumni of Creative Artists Network at The William Penn Foundation. The work will be on display through June 2005. The Prodigies website received several thousand hits in the month of January when the Japanese website X51.org picked up on Mundie's portrait of Pasqual Pinon, the two-headed Mexican, to illustrate a feature about Rebecca Martinez, the little Dominican girl born with an extra head joined to the crown of her skull (Rebecca recently passed away following surgery to remove the second head). The site is now turning up in Japanese search engines, driving even more traffic to the site. Curator Stephen Goddard of the Spencer Museum of Art at the University of Kansas chose one of James Mundie's woodcuts, Afterwards, for the exhibition Conflicting Memories at Salina Art Center (Salina KS) from October 2003 through January 2004, and the Spencer Museum of Art (Lawrence KS) from 7 February through 4 April 2004. The Spencer Museum of Art described Conflicting Memories as "an opportunity to examine how works of art participate in recording our cultural past — a process that often involves conflicts between the histories established by those in power and the alternative histories of those subjected to that power... Conflicting Memories includes work from the past five centuries, but is primarily dedicated to contemporary art and to the recent notion of cultural memory, a term that describes the essential cultural record that is passed on to succeeding generations through such avenues as ritual, celebration, advertising, consumer items, literature and the arts." The Prodigies site has been included in The World Artist Directory, and several other directories including Tatet. For the week of 21 November 2003, Mundie's Prodigies was the featured site in the 'drawing/sketching' section of about.com. "Aficionados of good web design will also enjoy the Victorian sideshow metaphor sustained throughout the website, which is beautifully presented without sacrificing ease of navigation." Mundie's Portrait of Lazarus and Joannes Baptista Colloredo was used as an illustration for “Material: Charlotte Kerner, Blueprint. Blaupause” in Unterrichts-Konzepte Deutsch-Literatur, published in Germany by Stark Verlag (Hallbergmoos), December 2002. 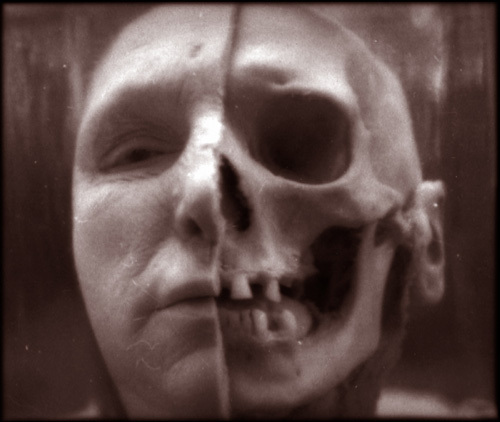 In May 2002, James Mundie was profiled along with artists such as Joel-Peter Witkin and Rosamond Purcell in The Mütter Museum: The Body as Spectacle, Specimen, and Art, the doctoral dissertation in visual anthropology presented at Temple University by Nora Jones. The work looks at the way in which the Mütter Museum of the College of Physicians of Philadelphia has served not only as a repository of medical knowledge, but also as an aesthetic treasure trove to visual artists. James Mundie was featured in Simon Brett's An Engraver's Globe, published by Primrose Hill Press (London). Brett, a British wood engraver, spent two years putting together this anthology, which he describes as ‘an extension of one artist’s enthusiasm for the work of others.’ The book is a comprehensive survey, showing the work of over two hundred contemporary artists from twenty-three countries. Few art books allow the comparison of such varied aesthetics through the lens of a single art form.